This is a series of five, so you can find the review of the first book here! Given that this is a reread, I don’t remember much of this one. I had a feeling this was the one where a certain character was involved, but I honestly couldn’t remember if it was this one or the next one. Shows how much I remember, guys. Anyway, I don’t think this one was as strong as the first book, but it was really just as fun. 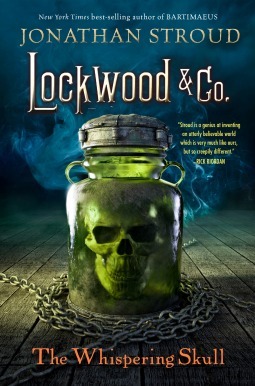 After the first book (and spoilers might be in here) explores the continued animosity between Lockwood and Co. and the Kipps gang. They make a bet and the story develops from there, going down a wild ride. The focus of this book, until the end, is developing George and the Skull. In this, they find out how little they know about George and just how little they care about him or what he does. He’s largely taken for granted. They don’t notice him as a member, and that really hurts them this time. Then, the Skull. That jackass. Really, you get his backstory and the development of his purpose for the story as a whole. Again, I highly suggest this series. It’s hilarious at times and is also really tense. What else? Great cliffhanger this book.